The Sixth Edition offers a basic explanation of the legal rights and responsibilities of people in both the public and private sectors. 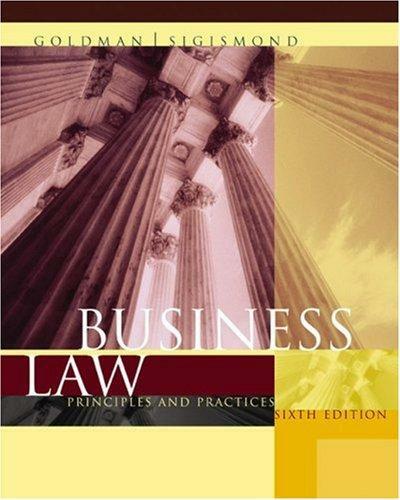 Co-authored by a practicing attorney and a college professor, "Business Law" features practical and up-to-date content written in clear, straightforward language. The authors avoid using court jargon and show rather than tell students about the law with in-text examples, current and interesting cases, and ethical dilemmas.In-text examples immediately illustrate and reinforce the concepts under review. At the end of each chapter, "Cases for Review" present mini-cases and ask students to review the facts and make a judgment based on concepts learned in the chapter. "Questions and Problems to Discuss" also test students' comprehension of key chapter topics.Arnold J. Goldman is the author of 'Business Law: Principles and Practices, 6th Edition', published 2003 under ISBN 9780618302932 and ISBN 061830293X. Loading marketplace prices 10 copies from $0.82 How does the rental process work?